Recognize that restaurant entrepreneurs often make poor food safety choices, putting their establishment’s reputation and sales at risk. Learn how to prepare for health department inspections through employee training and self-inspections. Understand the health inspection process and what inspectors are looking for. Learn how to respond to a poor health inspection grade. In the U.S., just about every eating establishment undergoes unscheduled inspections by trained public health officials. People seem to “clean up” when they know “big brother” is watching, and a bad inspection grade from one of these health officials could cost your restaurant thousands of dollars in lost sales. Corporate executives understand the importance of food safety very well. They tend to view it under the umbrella of protecting their brands, and they have the layers of management and the money required to make it a priority. And while smaller operations also understand its importance, their more limited manpower and financial means often lead them to make poor food safety choices. These entrepreneurs often become interested in food safety only after a negative event — such as a poor health inspection grade — occurs. It is this latter group of entrepreneurs whose actions I hope to change. If they don’t display genuine concern about food safety and sanitation, their attitude will rub off on their employees. And if employees are not trained and reviewed via self-inspections on a very regular basis, these entrepreneurs are extending an invitation to the health department to take action that will harm their business. This article is meant to educate entrepreneurs on (1) how they can prepare for health department inspections through employee training and self-inspections, (2) the health inspection process and what inspectors are looking for, and (3) the health inspection grading system and how to respond to a poor grade. A note about the information in this article: The Food and Drug Administration (FDA) issues the FDA Food Code, which is a science-based code that provides recommendations for food safety regulations. Although the FDA recommends that states, cities, and counties adopt the FDA Food Code, it cannot require that they do so, and many health departments issue their own regulations. Despite considerable overlap between the regulations supplied by different health departments, there are also minor differences between them. The specifics of this article therefore may not be entirely accurate for every city and town, but readers should be able to easily adjust what they read here for their own use. Before delving further into the topic, I would like to say that if I had to choose one concept that has the greatest impact on your food safety efforts and your quest for a top health inspection grade, it is this: The most effective way to show employees that food safety is a critical part of their job is to have it affect their compensation. Restaurants can create food safety bonuses that rise or fall depending on how the restaurant performs in health department inspections or inspections by a third-party auditor/consultant. When maintaining a top grade is expected and nothing less will be accepted, a lower score may disqualify management from receiving a bonus. The most effective way to show employees that food safety is a critical part of their job is to have it affect their compensation. Most restaurants today set financial goals, and if these goals are met, incentive bonuses are given to both front and back-of-the-house managers. You can easily incorporate food safety into such a system, and — although I have not heard of anyone doing so — it would be a good idea to also make non-management-level employees part of a bonus structure tied to food safety. The key to preparing for your health inspector is to ensure that your staff is educated and then self-inspect — daily. While some restaurant employees such as secretaries and valet attendants do not handle food, most employees do handle food in some way or another, and they need to have some type of food handlers training. Bartenders cut fruit, make fresh juice, handle dairy, rotate stock. Food runners deliver food plates, prepare garnishes, clean plates off. Bussers deliver beverages, make hot drinks, clear dirty tables and reset clean tables. Servers do some or all of the above and need to understand allergens in prepared foods. Hosts may also help deliver food, clear dirty tables and reset clean tables. Chefs and cooks handle food from the back door to the plate and keep the kitchen safe. Dishwashers clean and sanitize glassware, dishes, pots and pans. The key to preparing for your health inspector is to ensure that your staff is educated and then self-inspect ― daily. Many states require such employees to have a food handlers card (the title of this certification can vary by state), which is a certificate that is valid for three years and issued after approximately three hours of training and a written test. New employees usually have up to 30 days from the onset of their employment to get this card, and the restaurant that pays for the training is sending the message that it is important. Training is usually available online, and at roughly $10 to $15 per exam, it is not expensive. In states that do not require a food handlers card, it is a best practice to have as many employees as possible trained in the basics of food safety via a nationally accredited food safety certification. ServSafe, which is offered through the National Restaurant Association, is the most popular option, but there are others to choose from, such as Premier Food Safety and Learn 2 Serve. Note that I have encountered fraud related to this certification, often in the form of one person taking the exam for another for whom language fluency is an issue; consequently you may need to “re-teach” the information covered by this certification. Also, compliance is an issue: When I inspect restaurants in areas that require the certification, I take a random sampling of employees and ask for their food handlers cards. There are always one to three people that either do not have it or have an expired certificate. A certified food protection manager works within an establishment and oversees and enforces the food safety guidelines; most states require you to have one such manager per establishment. Training programs in food protection management cover the same topics seen in food handlers’ training programs but in more detail, and they also include broader topics that involve management functions. Although it may not be required, I believe that the responsibility to obtain this designation should generally fall upon more than one person and include the owner, the general manager, head managers, and the head chef. Their ultimate responsibility is to train their managers, cooks, and staff on food safety procedures, in large part preparing them for both internal and third-party inspections. They should ensure that training becomes a part of each day’s routine, and that self-inspection checklists, food logs, and maintenance reports become a way of life. And the more locations you have, the stricter the process should become simply because there is more at stake. Employees in states that don’t require a certified food protection manager can still obtain the requisite certification training from a variety of organizations, including the nationally accredited food safety programs mentioned in the “Employees who handle food” section above. Although not all training programs in food protection management are identical, they are all based on the FDA Food Code. This certification consists of approximately eight hours of classroom training and a written test, and the certification is good for five years. Again, if the restaurant believes in food safety, it will pay for this training; doing so shows employees that the training is important. When it comes to compliance, in my experience chefs and managers always obtain this certification, although it is sometimes expired. • Courses are available online (three months of access) and in a classroom setting (completed in one day) for approximately $125 – $135. • The exam answer sheet costs roughly $40 to purchase and process. • Tests are administered in person by a proctor for approximately $75 – $100. This cost may be reduced in a classroom where several students are participating. Lastly, note that some states conduct their own training for food handler cards and food protection managers, while others outsource it to independent training organizations. Most health department websites display a list of approved vendors that can provide both certifications. Before discussing the factors, I want to point out that the biggest mistake I see small operators make when it comes to training actually occurs before they begin training their employees. The problem is that they fail to qualify employees on their existing food safety knowledge during the interview process (e.g., do they know when to wear gloves, how long to wash their hands, etc.). Unlearning bad food safety habits can be hard, so it is best to hire those who are already on the right track. Prior food safety knowledge — The first thing managers/chefs need to be aware of is the low starting point for many restaurant employees when it comes to food safety. The training you require may be the first time your staff learns how to handle food safely. With school systems cutting back on classes in home economics, science, and health, basic food-handling procedures are often left to home instruction, and sometimes there is no one at home to teach these standards. Also, note that restaurants are frequent employers of first-time job seekers who are generally very young and sometimes still in high school. The result is that teaching food safety falls on the shoulders of the restaurant manager/chef. That said, in the past few years, more and more culinary schools have been teaching ServSafe and other food safety classes, which is a great improvement over the absence of such classes in the past. Unlearning bad food safety habits can be hard, so its is best to hire those who are already on the right track. Immediate training — Food safety and sanitation operating procedures should be introduced as soon as an employee is hired. It is easier to train staff on procedures from the start, and introducing such information after employees have been working for a while may spark a negative attitude from some who feel that this new “task” they are being asked to perform is not part of their job because it was not discussed when they were hired. Part-time workers — Given that practice makes perfect, it can take more time for these workers to become proficient in their positions. Managers can address any such issues regarding part-time workers with ongoing training efforts. Foreign workers — Lack of English reading and writing skills may cause confusion and the inability to follow directions correctly, and note that some restaurant employees do not read or write even in their native language. Further, not all countries have the same high level of food safety standards as are prevalent in the United States. Address these issues as early as possible by questioning potential employees during the interview process. Staff turnover — The restaurant business experiences a high rate of turnover for a variety of reasons: most young employees consider a restaurant position just an entry-level job, starting pay for an unskilled employee is low, and some jobs (dishwashing or building maintenance) are not very desirable. As employees move on to better things, you should be prepared to constantly train new staff members. This constant need for training does not come without some cost, and most companies will train the first or second generation of employees before the commitment wanes and employee turnover takes its toll. Entrepreneurs must keep in mind that if a foodborne-illness outbreak were to occur and be traced to their establishment, the financial fallout and bad press could be staggering compared to the effort involved in staff training and development. Specifying responsibilities — Start with a clear job description outlining exactly what you want your employees to do when it comes to food safety. They will generally comply with signing a document stating that they fully understand what is expected from them. Learning about food safety through the certifications noted above is just the start. This learning is put into practice by way of constant self-inspections. Most health departments have self-inspection forms on their website. If your local department’s website does not have them, you can use the self-inspection forms provided by the health department of a nearby area as your guide. No one has a monopoly on such forms, and some restaurants create their own. It would take up too much space to reprint a two-and-a-half page self-inspection form here, but to give you an idea of what such forms include, much of the content covered by the professional certifications noted earlier are related to inspections (both self-inspections and health department inspections), and a later section of this article, titled “What health inspectors are looking for,” contains lists of items that should be ready for inspection. To put the topic of self-inspections into context, I should point out that the most common mistakes small operators make when it comes to self-inspections are (1) not performing them often enough — an issue that stems from lack of manpower/resources, and (2) not fixing problems found during these inspections — a decision that is most often financially driven. Front-of-the-house and back-of-the-house self-inspections (usually conducted by a manager and chef, respectively) can each take about one hour to complete, and they should each be performed twice a day, before the morning and evening shifts. The first inspection allows you to see if anything happened from the time the restaurant closed down until the first manager/chef arrived in the morning, and most problems (refrigeration running too hot, freezers not working, broken ice machine, etc.) can be fixed before the morning shift begins. Weekly and monthly self-inspection reports that are generally prepared by a manager or chef are critical for keeping managers and owners aware of areas of concern — especially those that require follow-up and possibly capital expenditures. And keeping these reports on site comes in handy when the health department arrives, if only to demonstrate that food safety is a priority in your establishment. To be in a position to pass your self-inspections (and the health inspector’s inspection), every restaurant should follow daily, weekly, monthly, and quarterly cleaning schedules. The cleanings should be thorough and cover all areas, including both the front and back of the house and areas outside of the establishment. The list below provides an idea of how often you should be cleaning different areas/items. • Daily — Sweep and mop all floors; clean all counters, under-counter shelving and refrigeration shelving, small equipment, floor drains, and dishwasher surfaces. • Weekly — Clean all internal fan guards, refrigeration door gaskets, oven gaskets, underneath fryer wells, the grill vents above grills, inside ice machines, all garbage cans, and the walls around equipment; defrost the small ice cream freezer. • Monthly — Deep-clean floor drains, ceiling vents, rolling carts, floor mats, and employee lockers. • Quarterly — Clean outside ventilation filters, internal and external dumpsters, staircases, and storage units. In addition, restaurants should understand their service contracts and ensure that preventative maintenance work is performed according to schedule. They should list maintenance/renewal schedules for items that include elevators, dumbwaiters, refrigeration and HVAC equipment, hot water heaters and boosters, mechanical equipment in the kitchen, grease traps, interceptors, pest control services, hoods, ducts, fire suppression systems, fire extinguishers, knife and slicer blades, medical supplies to treat cuts and burns, licenses, permits, and food safety certifications. Finally, you should keep all documents related to the health department in one place. Creating a “Food Safety Binder” is preferred in most cases, and you should use this binder to hold your last three health department inspection reports, self-inspection reports, maintenance and temperature logs from the past three months, fire extinguisher repair reports, exterminator’s reports, etc. Keeping such information in one place is handy when the inspector is on site. If both staff and management have been consistently focused on food safety and sanitation, you will be well prepared for a visit from the health department. Operators of restaurants of all sizes generally view a visit from the health inspector as an inconvenience — an interruption during the day — as opposed to an opportunity to learn. In fact, many operators hate the health department. This is the wrong attitude to take, but it does explain why restaurants seem to dread health inspections. Inspections are unannounced, but if you are prepared with an educated staff and a history of routine self-inspections, you won’t have reason to fear the inspector’s visit. The more complex the operation — e.g., large facilities with multiple proteins and multiple food processes such as cooking, reheating, and preparing sushi — the more often the health department will visit (perhaps two or three times a year). A coffee house, retail operation, or small bakery with no major protein food preparation may be visited by the health department just once a year. If you consistently receive B-level or C-level inspection scores, you can expect to be inspected up to four times a year. If someone reports your establishment for a foodborne illness or for substandard operating procedures, the health department is mandated to come out and inspect based on that complaint. All complaints must be investigated by the health department. An inspector is usually assigned to a particular area, so you are likely to work with the same one repeatedly. This can be a blessing in that you can get used to the person’s style of inspecting and what they tend to look for, but if you don’t get along with the inspector, this could seem like a curse. Keep in mind that, especially in areas with larger populations and therefore more inspectors, if you feel that your inspector’s attitude may be affecting the fairness of the grading process, you can call your local health department and request another inspector. Based on my experience, in most cases the health department will accommodate your request. You would make the request after the inspection takes place, and you should be ready to pay for the second inspection (I have seen charges in the $300 – $500 range). Note that in such cases the original inspection is still valid, but the new inspector could arrive within a number of days to issue a new inspection report. The timing of the inspector’s visit can be completely random, but it will be in accordance with the facility’s posted operating hours (e.g., a late-night bar with food service can be inspected at 11:00 p.m.). When the inspector arrives, the first person to see the inspector should make it known to the kitchen, without being obvious, that an inspection is about to take place, and someone should also let employees in the front of the house know that this is the health inspector who will be checking the facilities. Greet the inspector warmly and ask for identification. The inspector will usually request and wait for the person in charge. The next step is simply to ask what area or information the inspector would like to see first. Often at this point the inspector will want to look at copies of the last inspection report, management and employee food safety certifications, hazard analysis and critical control points (HACCP) plans, and permits and licenses, all of which should be in the Food Safety Binder I suggested earlier. Most will then begin the inspection at the front door or receiving area before going into the kitchen, walk-ins, freezers, dishwashing areas, storage areas, and then out to the service line, buffets, restrooms, dining rooms, bar, waiter service areas, dumpsters, and parking areas. Most inspectors will want to walk through the facility with the person in charge or the chef, who should take notes and explain situations only if asked. Do not be combative or defensive. If you stay calm, the inspector is likely to stay calm. Be attentive and respectful with the inspector, and thank the person or ask for clarity as problem areas are pointed out. The inspector is expecting your full attention, and when you provide it, he or she will usually give you time to explain a situation. This may work in your favor. There is no norm when it comes to an inspector's style. Some inspectors are very strict and some are not strict at all. Some inspectors will circle back to a violation if you say that it will be corrected on site (COS). Such violations could include adding a thermometer to a lowboy, cleaning the handle of the spray nozzle at the three-compartment sink, lowering the dumpster lids, etc. In some municipalities, the report includes a section for COS situations. Although such violations may be recorded, you might not be penalized for the original violation. There is no norm when it comes to an inspector’s style. Some inspectors are very strict and some are not strict at all. Some will go into great detail explaining the reason for a violation and others will not. Inspectors will choose a quiet area to write the inspection report and review it in depth with the person in charge, and then both parties sign the report. The report is left on site or emailed to the person in charge, and in most cases it will also be posted to the Health Department’s website and become part of the public record. The length of a given health inspection depends on the size and complexity of the food operation and the facility’s layout. I estimate that a 1,000-square-foot operation may take an hour to inspect. Note that the inspection can slow down service, and, in fact, most operators will slow down both food and bar service so that each area can prepare for the inspection. I have even known owners to shut down their restaurant until the inspector is gone. Throughout the process, remember that health inspectors are your friend, not your enemy. These inspectors undergo extensive training programs that can last up to six months, and they are here to teach, they are here to inform, and most important, they are here to correct faults so that we all serve safe food. To get an idea of what your inspector is looking for, look up restaurants in your neighborhood and review their inspection reports. Most health departments post the reports and list the exact violations that occurred, and this exercise will allow you to determine the most common violations in your area. It is also a good idea to visit the health department’s website and find an example of their health inspection form (something I suggested earlier to help with self-inspections) and their Restaurant Inspection Guidelines (these guidelines can go by different names, and they describe the food code inspectors are grading against). No tiles cracked or missing, lights protected with plastic shields or plastic tubes, air-curtains working at delivery doors, doorways use air pumps for closure. Floors, floor drains, walls, and ceilings clean and in good repair. Containers covered and labeled. Gaskets, fan guards, shelving, and all types of door handles clean. Thermometers present in all refrigeration units containing proteins. Taking random temperatures of hot and cold foods at all stations to make sure temperatures are maintained at the proper levels for cold holding and hot holding. Dining room furnishings in good condition, restrooms properly stocked and in working condition, garbage and trash areas have proper receptacles that are covered and rodent proof, basements are rodent proof and with proper lighting. Storeroom door closed, everything stored six inches off the floor and away from walls, cans inverted, boxes sealed closed, no flies or insects in dry ingredients. Single-service items wrapped in original sleeve, to-go boxes inverted, cases sealed closed. Can opener and blade clean, containers inverted, utensils stored handles up, clean equipment. Hair covered, uniforms clean, aprons on, condition of hands (looking for cuts, open wounds, rashes), gloves on, gloves available in a variety of sizes. Hand sinks clean, hot water 100ºF +, soap and paper towels available, trash can available with no obstacles in its way. Stoves, grills, fryers, vents, hoods, and filters present and clean; kettles working. No cell phones in work or food areas, and no beverages, food, or tobacco in back of house. Good retail practices violations are low-risk violations that do not require immediate action. Violations in this category result in a one-point deduction, and, depending on your municipality, you can lose up to 10 points and still receive a score of 90 (each inspection begins with 100 points), which equates to an “A” rating. Nonfood-contact surfaces clean and in good repair — This violation refers to items that do not come into direct contact with food and include gaskets, fans, garbage cans, mop buckets, floor mats, shelving, etc. Equipment/utensils approved, installed, clean, in good repair, and in the proper capacity — This violation refers to household utensils and equipment that are being used in the restaurant. Examples of this violation include aging equipment and cooking utensils, and appliances that are dirty and perhaps not large enough in capacity to handle the demands of the business. Equipment, utensils, and linens: storage and use — This violation refers to equipment, utensils, and linens that are improperly used or stored such that they may become contaminated and need to be replaced. Floors, walls, and ceiling: properly built, maintained in good repair, and clean — This violation is concerned with the condition and the maintenance of these surfaces and whether or not proper finishes (e.g., durable, skid resistant, nonabsorbent) are used. Violations include holes in wall tiles, wooden walls in the kitchen or at the bar sink, and rugs used on the kitchen floor. Plumbing, fixtures, back-flow devices, drainage — This violation covers all issues regarding water flow from sinks, drains, toilets, and refrigeration. Violations include missing back-flow devices on utility sinks, sinks not being attached to the wall, refrigeration lines draining onto the floor, and no floor drain being present. A minor violation does not pose an imminent health hazard, but it does warrant an immediate correction. A minor violation could lead to a two-point deduction. Food in good condition, safe and unadulterated — This violation occurs when food is left out or stored in unsafe areas (e.g., near cleaning supplies or in a restroom), and when ice crystals are forming on food due to improper defrosting and refreezing procedures. Adequate hand-washing facilities supplied and accessible — This could also be a major violation depending on how many violations occur. Examples: Lack of hot water, soap, and/or paper towels; a transit cabinet placed in front of the sink, inhibiting access to the sink; missing hand sinks; and not enough sinks in a work space. Toxic substances properly used, identified, and stored — Examples: When caps fall off chemical containers, when cleaning supplies are transferred out of their original containers into spray bottles and are not relabeled, and when chemicals are stored near food products such as vegetable oil spray. No rodents, insects, birds, or animals — It is a minor violation when you see filth flies or one live roach, but this violation can close a restaurant down if there is an infestation. Keeping your floors, drains, and corners clean helps to prevent pests, and keeping your doors shut prevents them from flying in. Proper eating, drinking, tobacco, and cell phone use — Employees can eat, drink, and smoke only in designated areas, and they cannot perform these actions as they prepare or serve food. Cell phones are hard to sanitize and not welcome in most kitchens, as they are generally sitting on top of cutting boards or counter surfaces (and contaminating those areas). A major violation poses an imminent health hazard that warrants immediate correction and may require closure of the food facility. A major violation could lead to a four- or five-point deduction. Proper hot and cold holding temperatures — This violation can occur in reach-in refrigeration lowboys, top-cold holding units, walk-in refrigerators, and on stovetops. Have thermometers present. The only way you can control the rapid growth of bacteria is to make sure food is held outside of the temperature danger zone, which is between 41ºF and 135ºF or 140ºF (the required level depends on your local health department guidelines). Hands clean and properly washed, gloves used properly — This violation occurs mainly when hands are not washed long enough, soap is not used, or gloves are not worn when handling ready-to-eat foods (e.g., when dicing cooked chicken for buffets, etc.). Food contact surfaces clean and sanitized — This violation can occur when surfaces that come into contact with food are not washed, rinsed, and sanitized, when sanitation buckets are missing from active food preparation stations, when the supply of sanitizing solution is too low, and when mold and yeast are found on the inside rim/ice chute of an ice machine (ice is a food). Note that all surfaces of an ice machine must be clean, including the scoop and its holding container. Communicable diseases: reporting, restrictions and exclusions — This violation can occur when employees show up for work sick (and note that sick employees are often the reason behind the spread of foodborne illness). Create good relationships with your staff so they will self-disclose medical conditions. Proper reheating procedures for hot holding — After food has been cooked and then cooled down and chilled, during the reheating process food must reach 165ºF for 15 seconds in order to kill any bacteria that have been growing. An inspector can test for this violation by asking an employee to what temperature they reheated the food and for how long. It is critical to remember that in most cases, correcting issues on site will help raise your score, and the reason for not receiving a top score could be a few easily correctable issues. 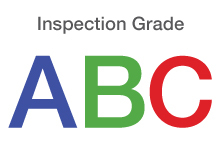 Your inspection results get summarized into a single grade, and health department grading systems can vary by jurisdiction. These systems can come in the form of letter grades, a point system, or a pass/fail system, and sometimes violations can be accompanied by fines. Be sure you know the system under which you are operating and the point penalties attached to different violations, as these points determine how your restaurant performs during an inspection. If the manager walked along with the inspector during the visit, the inspection grade should not come as a surprise. So what do you do when you sit down with the inspector to review the findings and you receive something other than the highest rating possible? The first thing you should do with the inspection results is take them seriously. Retrain everyone in the areas identified in the report and make sure that you fix and repair for the long haul. This correction process starts with a prioritized list, and because repair and maintenance issues take time and cost money, it is best to start with the big things like cracked or missing floor tiles and grout, dirty fan guards, torn gaskets, and repairing broken equipment. If an inspection reveals a sufficient number of violations such that a restaurant would not earn or maintain a top rating, the owner will want a re-inspection. The fee for this type of re-inspection is usually in the “hundreds of dollars” range, and in the interim you may be offered a “Grade Pending” alternative, which gives you a specific amount of time to correct the violations before being re-inspected and displaying your resulting inspection grade. This is usually a good alternative to posting a less-than-top rating and easier to explain to guests and food bloggers. If you schedule a re-inspection, be certain to take care of all issues without delay. Note that even if you get a top inspection score, some municipalities will schedule a re-inspection for two weeks afterward ― at no charge ― to see if all problems were corrected. When the health department returns for the follow-up inspection two weeks to more than two months later, they usually inspect only the problem areas that were identified in the previous inspection. This is not always the case, however, and a full inspection may occur. Depending on your geographic location, in general when re-inspections occur, all corrections must be made or else fines will be imposed or increased (some states impose fines after the initial inspection). Note that even if you get a top inspection score, some municipalities will schedule a re-inspection for two weeks afterward — at no charge — to see if all problems were corrected. The system I have described provides establishments the opportunity to quickly right their wrongs, and this may leave you wondering why there aren’t fewer less-than-stellar health inspection scores in existence. The answer lies in the fact that restaurants cannot always choose to have a Grade Pending sign after first receiving an undesirable health inspection score (some states don’t allow it); states generally force restaurants to display their grade after a re-inspection has occurred — even if the resulting score is low, and some people are just too busy, too lazy, or too arrogant to fix the problems that the health inspector found. This topic is beyond the core focus of this article, but I want to mention it briefly. You can contest a rating by effectively “going over the inspector’s head” for a resolution and calling your local health department to complain. If you are not satisfied with the department’s response, you can then ask to go before a judge and have a hearing. In some cities a single point within your health inspection score can have a dollar value of $200+ (due to fines), so it can sometimes be worth the trouble to go this route. If you are involved in a complaint related to foodborne illness (which is serious), getting a lawyer might be a good idea. That said, a hearing can take all day or more, and you need to prepare for it by documenting all of your improvements and other efforts. This route does cost you time and money. While no one enters the restaurant business out of a love for food safety, owners and managers must take it seriously. By protecting customers from foodborne illnesses, you are protecting your restaurant’s reputation, and remember that thanks to blogs and social media sites such as Yelp, today’s bad news travels faster than ever. Staying on top of your food safety program is good business, and it will take much of the stress out of visits from the health inspector. If you like this article, please share it via social media or link to it. If you like our website, please follow us on Twitter / like us on Facebook. Mary FitzGerald, NCFPM, is the founder and principal of Safe & Sound Food Safety Consultants. Mary received her B.S. degree in Dietetics from Immaculata University. She opened and managed dozens of restaurants earlier in her career, and she has been a food safety consultant since 2009. Mary is a member of the Los Angeles Food Safety Auxiliary Committee, the National Environmental Health Association, and the South Nevada Food Safety Task Force. She is also a preferred vendor of the Los Angeles Health Department’s Approved Provider List to teach Manager Certification in Food Safety, and she is a nationally certified ServSafe trainer and proctor.